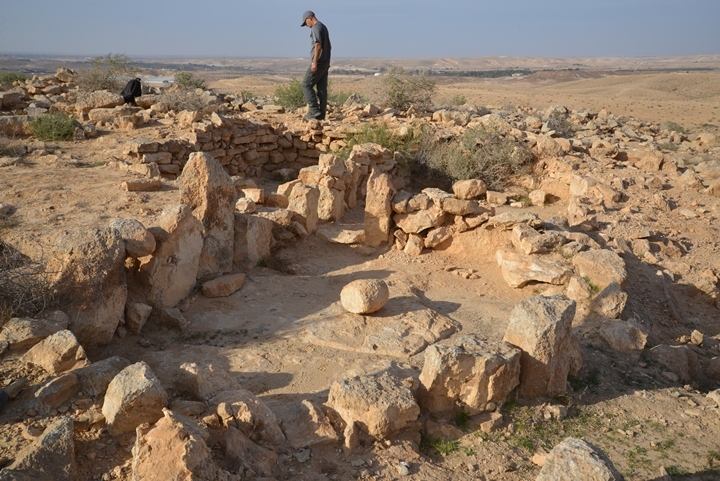 Remarkably preserved village in the Negev Highland area, dated to the Intermediate Bronze period. South of Kibbutz Mashabei Sadeh in the Negev Highland area is a remarkably preserved village dated to the Intermediate Bronze period. More than 200 structures have been identified on the hill, some of them excavated and reconstructed. This site is located in a desert area, with only ~200m annual precipitation. No adjacent water sources are located near the prehistoric site, nor any evidence of farming activities. This opens questions how these inhabitants survived and what was the nature and the purpose of their village. 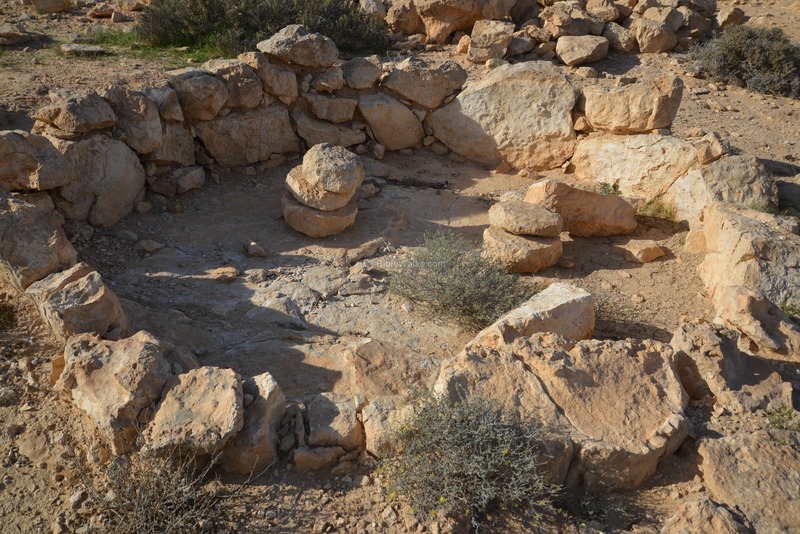 The prehistoric site of Mashabei Sadeh is located 3KM south of the Kibbutz, east of Nahal Heiman. 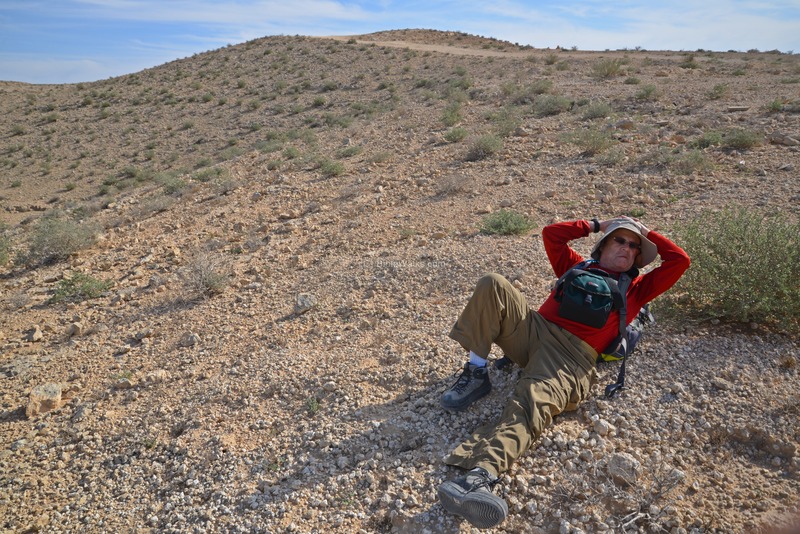 Access to the site is by foot or by a truck or a four wheel drive vehicle on a dirt road. 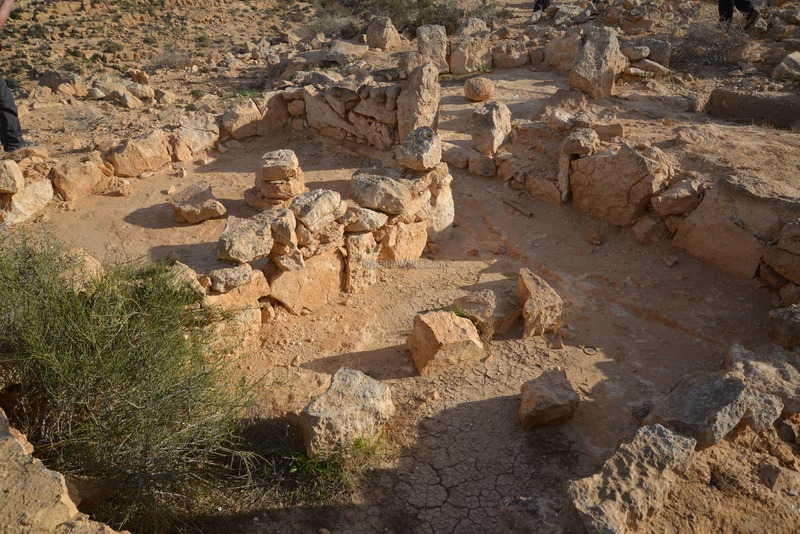 The Bronze age city is located on a ridge (altitude of 460m), which is surrounded by dry valleys. 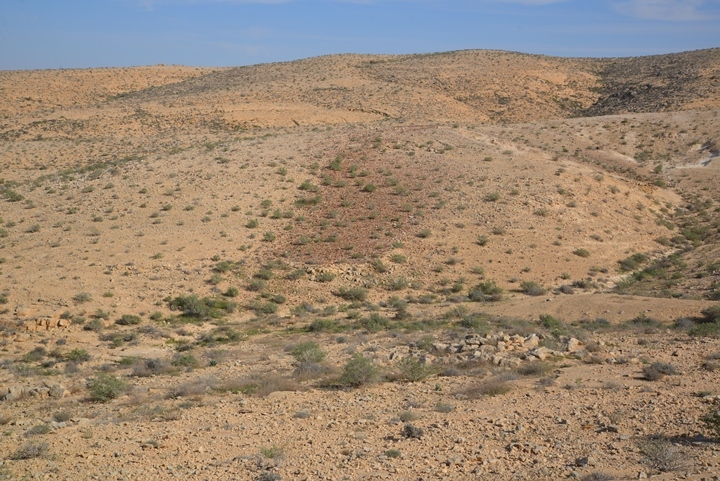 A saddle separates the ancient site to a north and south hills, on which more than 200 structures were identified. 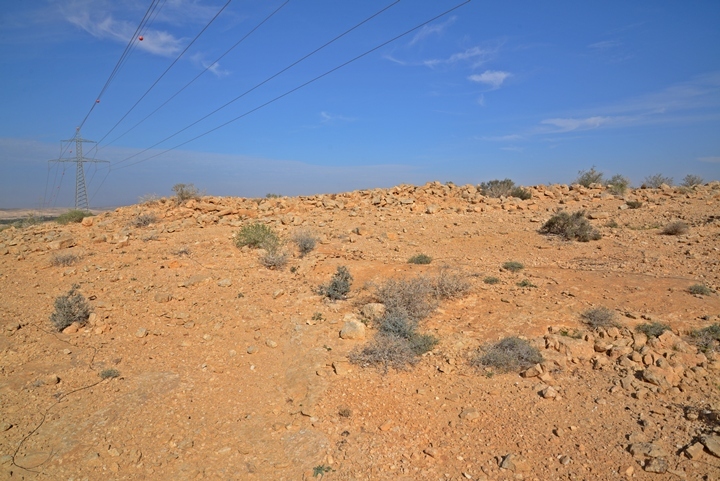 To the east of the site is another point of interest located on the top of a hill. During the Early Bronze (EB) period, large fortified cities existed in the Negev area, such as Arad (EB II 2900-2700 B.C. and EB III period 2700-2400 B.C.). However, during the end of that time, the EB III cities were depopulated in the Levant. This may have been a result of onset of drier climatic conditions, which resulted in insufficient resources to support the large cities. 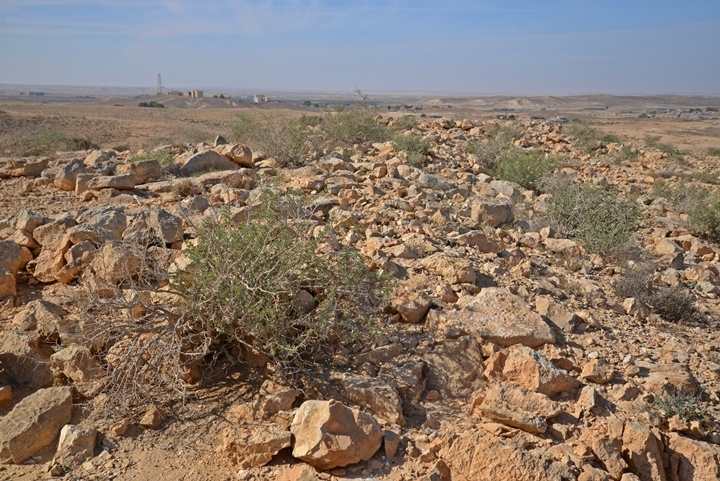 Most cities in the Levant disappeared and settlements were abandoned. The Intermediate Bronze (IB) period of the Israeli archaeology is also known as Early Bronze IV (2400-2200 B.C.) and Middle Bronze I (2200-2000 B.C.). 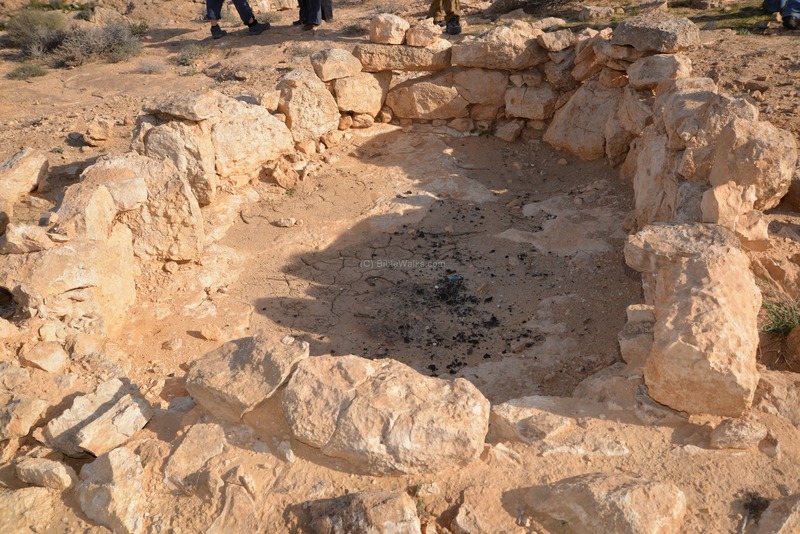 Some archaeologists of the Jordan Valley start the period in 2600 BC, while other date the end at 1950 B.C.. In any case, it is a period of great changes from the Early Bronze to the Middle Bronze period. During the IB period the population moved to smaller, seasonal and scattered camp sites that required less resources. None of these sites were fortified, as opposed to the formidable cities of the Early Bronze period. The old empires collapsed, like the Old Kingdom in Egypt that witnessed turbulent times and chaos. This was a dramatic social change - the shift from urban to non-urban life. The sources of income also changed to a pastoral and agricultural society, with emphasis on herding rather than farming. 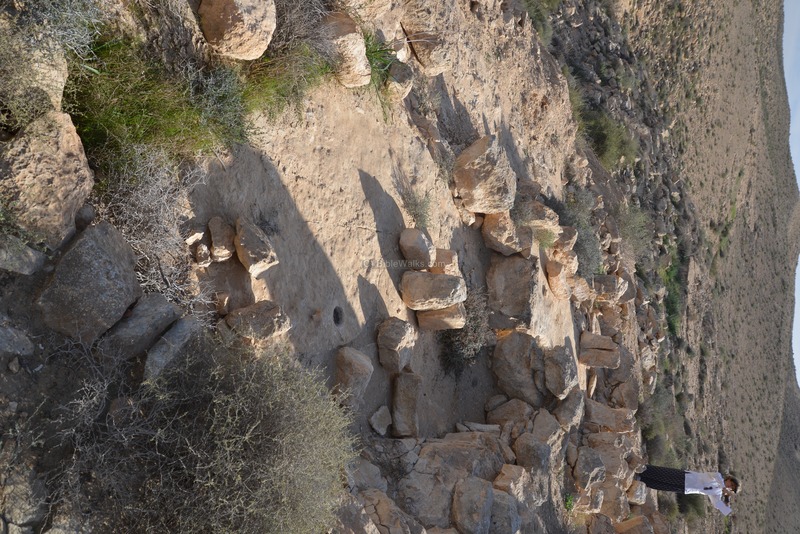 A village was established here during the Intermediate Bronze (IB) period, with more than 200 dwelling structures. 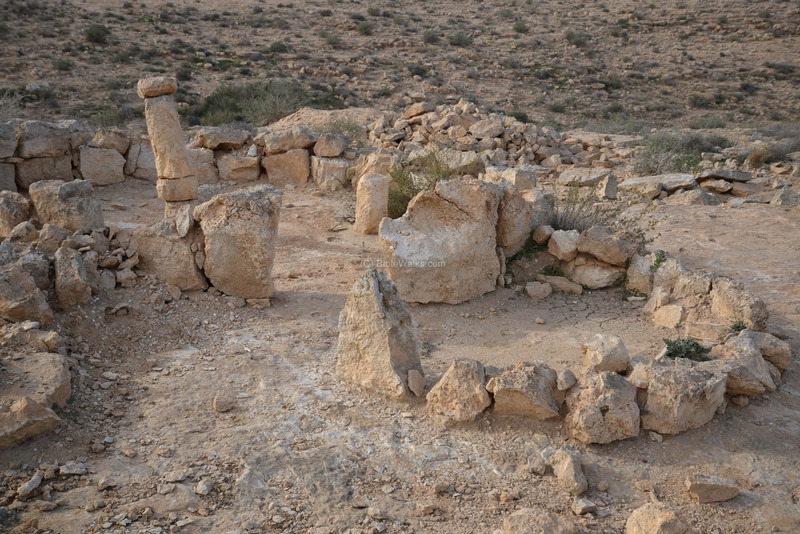 The scholars speculate that the village was a tribal center of nomads or semi-nomads. 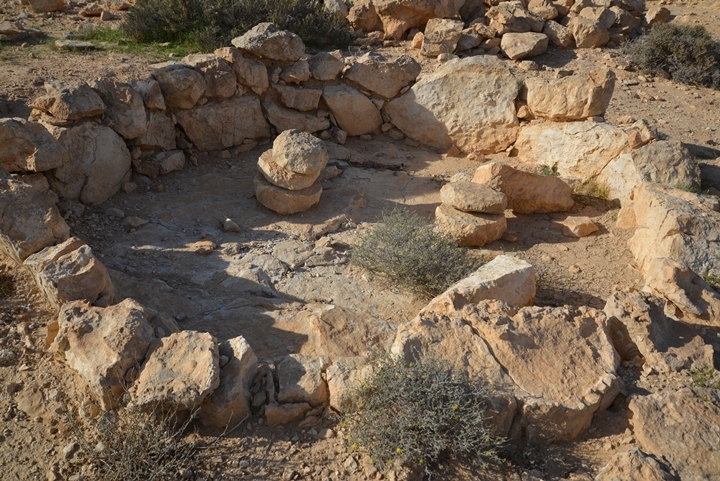 According to this theory, the village was not inhabited during the hot seasons, due to the lack of nearby supply of water. The villagers may have lived on nomadic herding, moving from the cooler places to the desert according to the seasons. Tumuli (burial heaps) were found on the ridges around the settlement. These tombs served as temporary burial sites, also suggesting the nomad characteristics of the village. 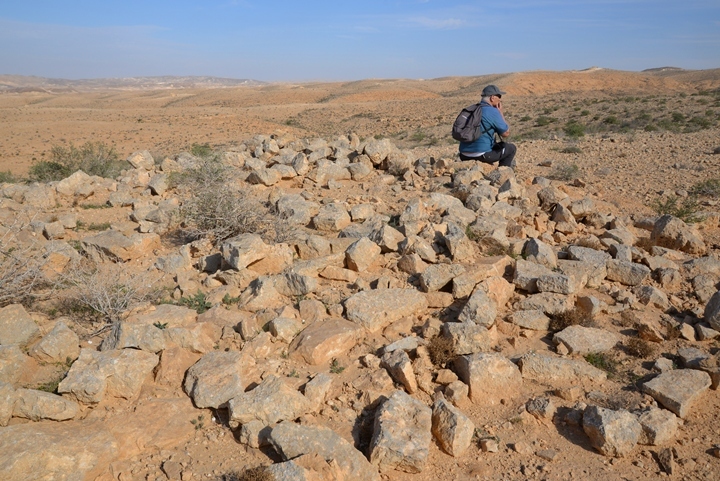 The number of Tumuli suggests that this settlement existed for about 1000-1700 years. 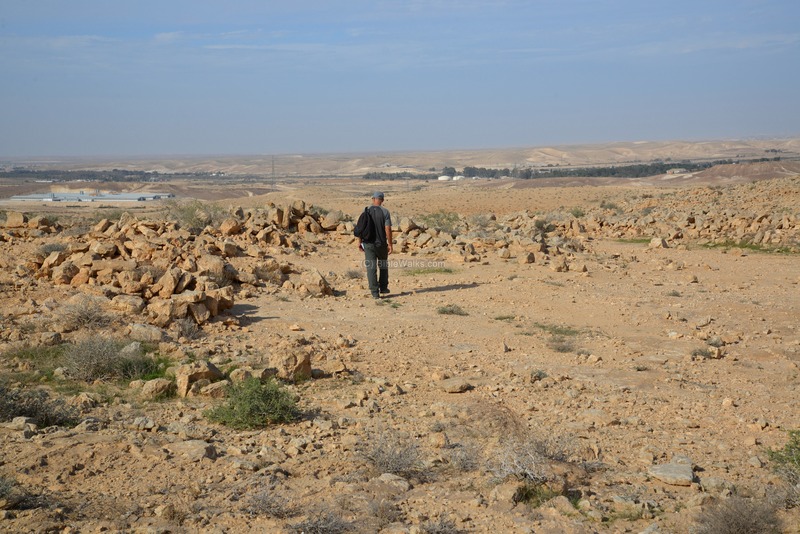 The site was excavated by a team headed by Dr. Rudolph Cohen, former Deputy Director of Israel Antiquities Authority (IAA). Dr. Cohen was also known to propose in an article that the MB I people were the Israelites of the Exodus, although conventional scholars identified the MB I people to the nomadic Israelites in the earlier times of Abraham (at a date of about 2000 B.C.). Kibbutz Mashabei Sadeh was established in 1947 as "Mashabim", then renamed to commemorate the Palmach leader Itshak Sadeh. The site is inside an open public area. It is accessible only on weekends, as it is located on the fringes of a military firing area. 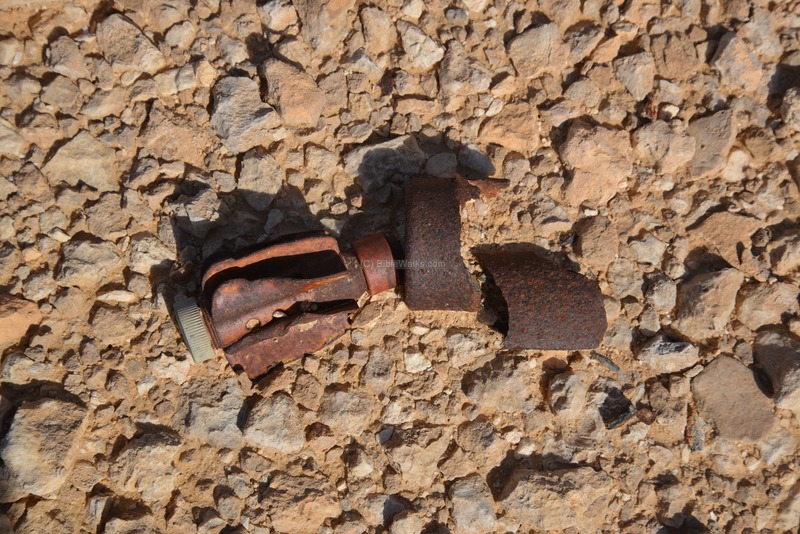 Hikers must be careful of unexploded ordnances. 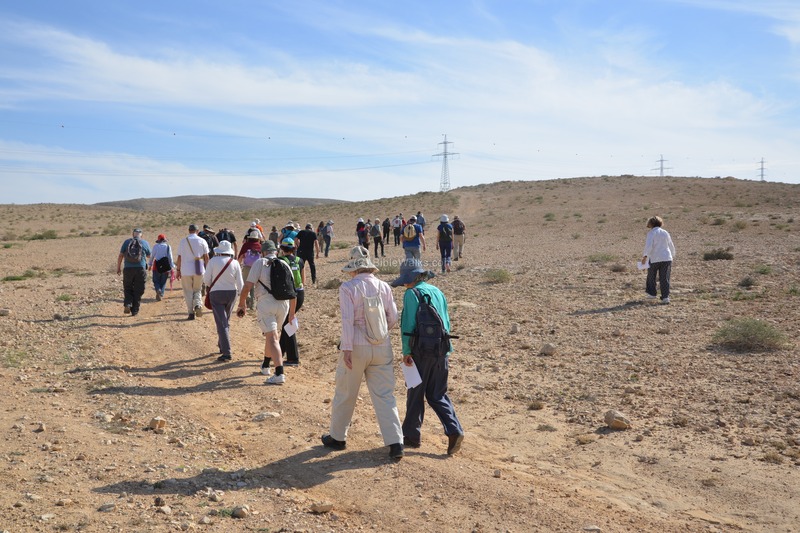 This tour was produced by "Tagliot" (Hebrew: Discoveries), and was directed by the archaeologist Dr. Ron Be'eri of the IAA and the University of Ben-Gurion. 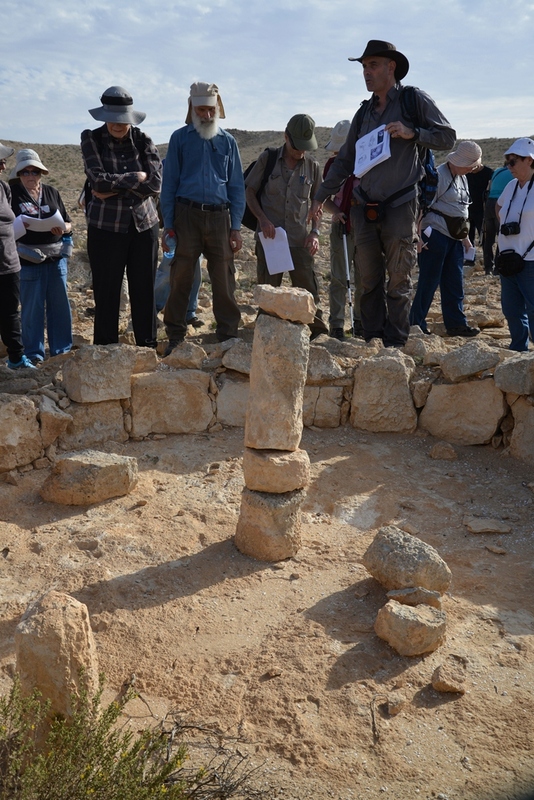 This was one of the most interesting tours we had so far, thanks to the site and the superb lectures given on the site by Ron Be'eri. The tour bus covered half the way from the Kibbutz, with the rest of the way on foot. 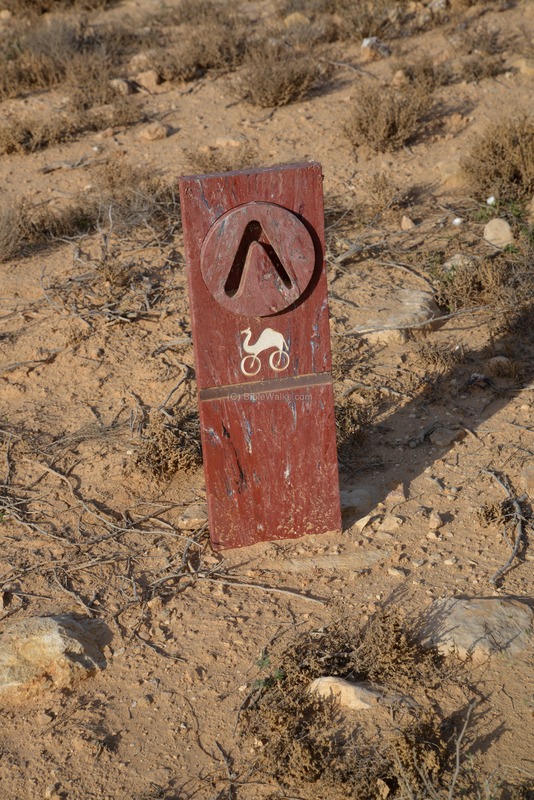 Another option is to ride a dirt bike, as indicated by the camel-on-wheels signs along the road. This route, known as the Haruv (Carob tree) route, starts from Sede-Boker and ends in Mashabei Sadeh. 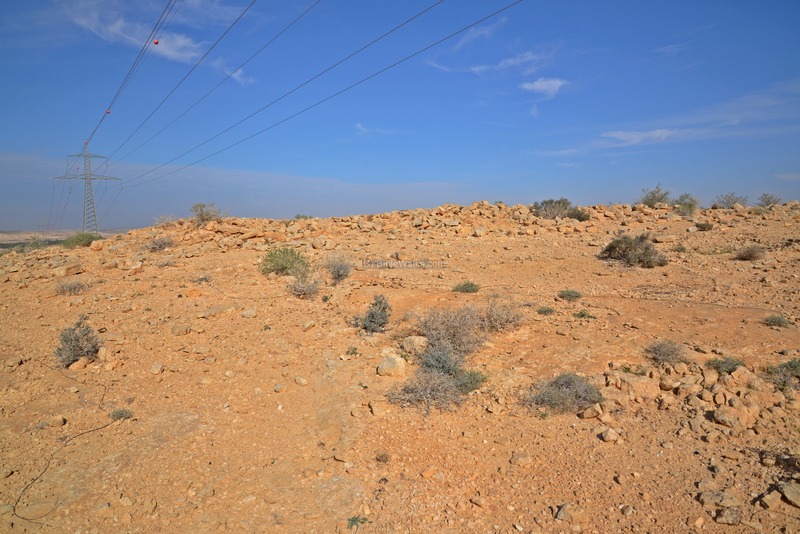 In the Negev are some great biking routes, as well as hiking and motor paths. The desert is where you can get a rich mix of 100% nature with 100% sports. Warning - The area is littered with remains of mortar bombs, flares, bullet clips and other remains of military exercises in this firing area. Therefore, be careful while hiking around, as there might be duds. Visits are allowed only on weekends, or alternatively need to be pre-coordinated with the military. 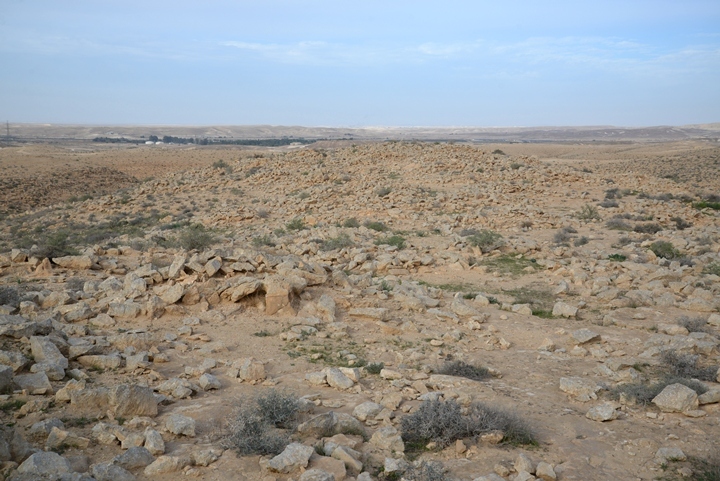 Along the road and surrounding the site are a number of clusters of tumulus. 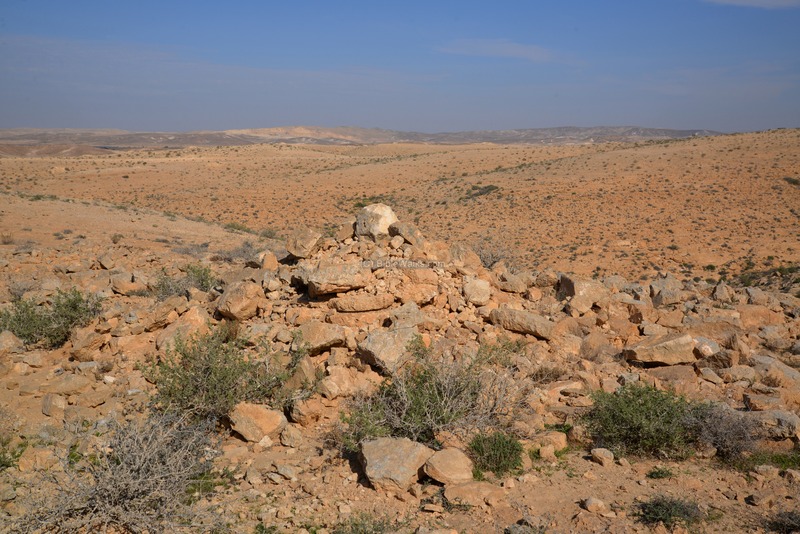 The tumulus (plural: tumuli) is a heap of stones which cover ancient graves. 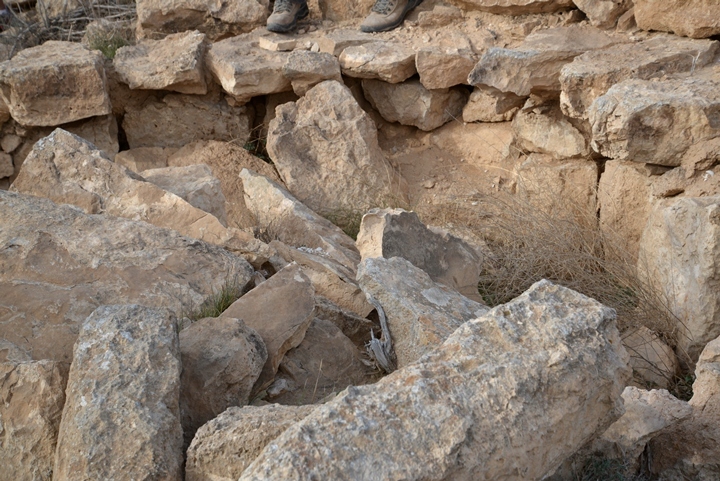 The tombs are located above the surface, but covered by a pile of stones. 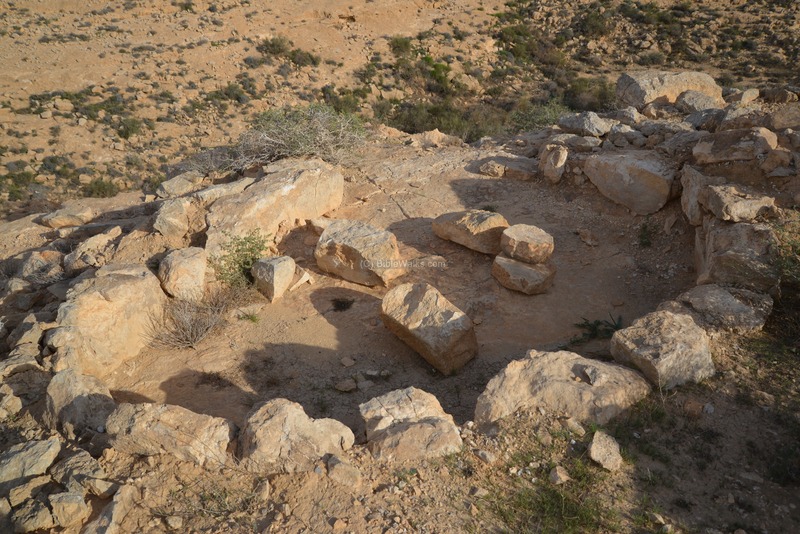 As opposed to shaft tombs that are found in the northern section of Israel, this burial method is typical of the Negev highlands as it does not require to dig into the hard surface and are temporary burial places. 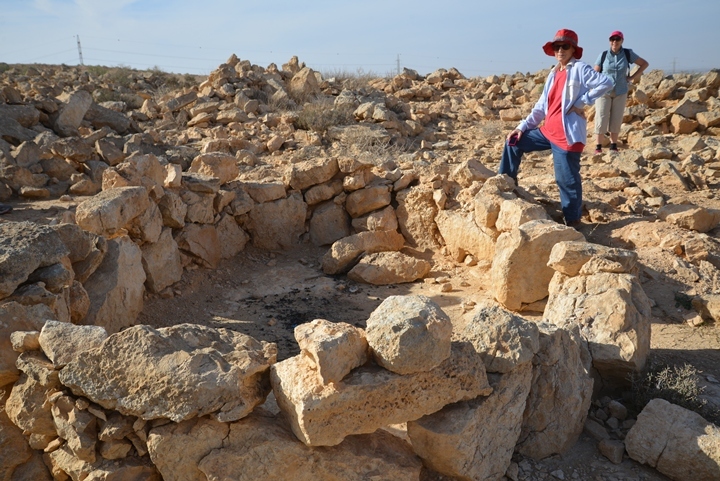 This photo shows a single tumulus located on the east side of the access road that ascends towards the site. A larger cluster of 4-5 tumulus tombs is located on the other side of the road, as viewed in the next three photos. The tumuli are dated to the Intermediate Bronze period (2400-2000 B.C.). In the Negev highlands more than 500 sites were identified that belong to the Middle Bronze period, and few are dated earlier to the Early Bronze period. This IB burial practice is also common in other regions in the Levant. Most of the burials are placed in stone-built tumulus, located on ridge tops near the ancient villages and close to the ancient roads, but not inside the settlements. 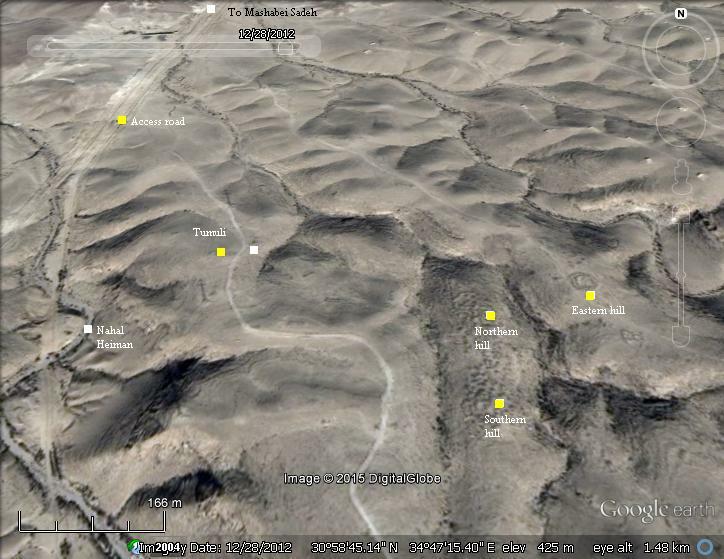 The location on ridge tops make the tombs visible, which was probably the intention of the builders of the tumuli. 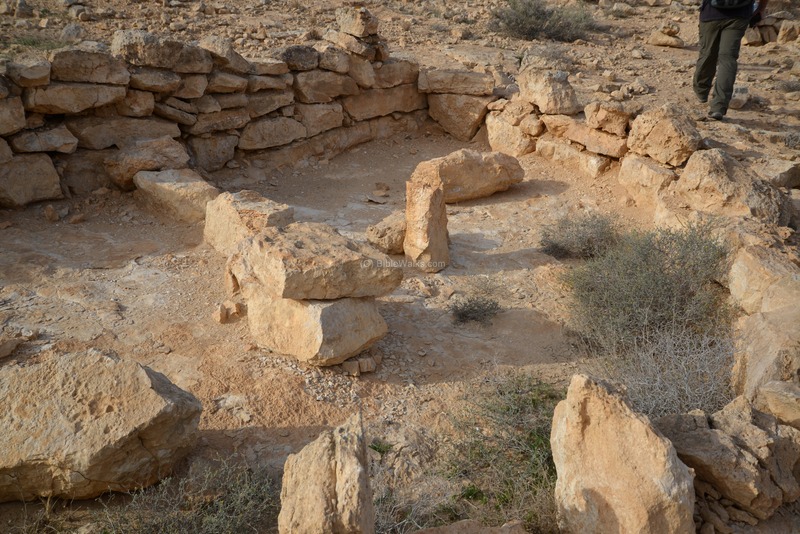 Due to the dry conditions, lack of modern settlements and absence of commercial value for the Bedouins, these ancient sites are in a great preservation state. They are virtually like an open museum! 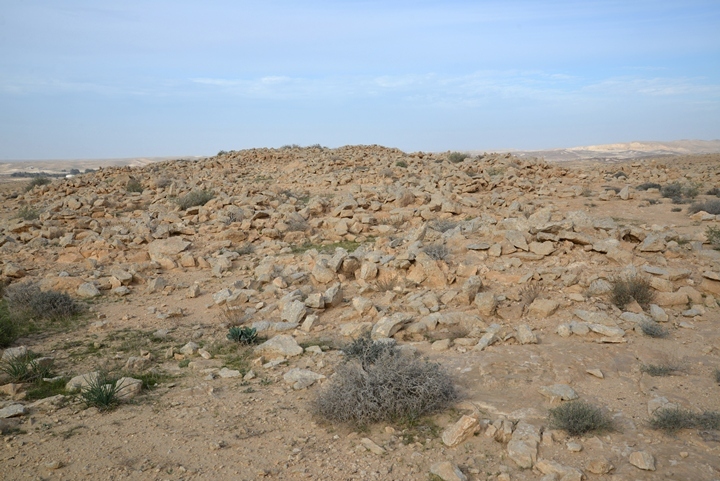 The most common tumulus of the Intermediate Bronze period is a shallow circular pile of stones, about 6m in diameter, with the rectangular tomb chamber in the center. 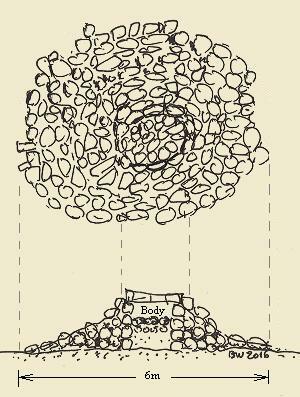 Each tomb houses a single body. Few items or ceramics accompany the dead. 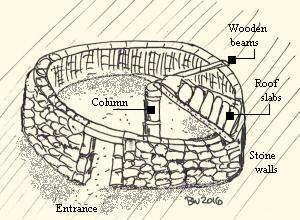 An illustration of a typical tumulus is shown here on the right, with a cross section in the lower drawing. 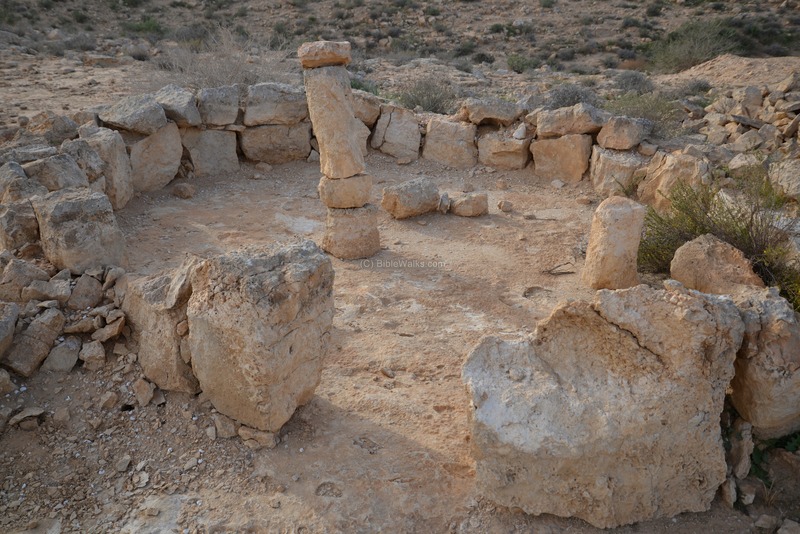 In many cases the tombs were found empty, implying that these were temporary holding places and subsequently the bones were transferred elsewhere to permanent shaft tombs. Another cluster of tumuli (plural of tumulus) is located on a higher altitude, south of the village, as shown in the photo below. 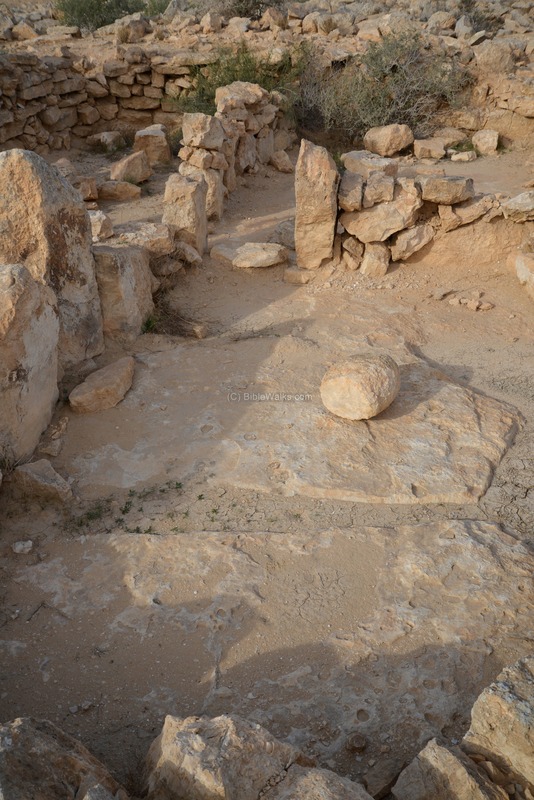 This cluster of tombs is about 25m in length and 5-6m in width. Each of the tombs in this Intermediate Bronze cluster had a place for a single body. Note that in a later period - the Canaanite MB II period (2000-1550 B.C.) 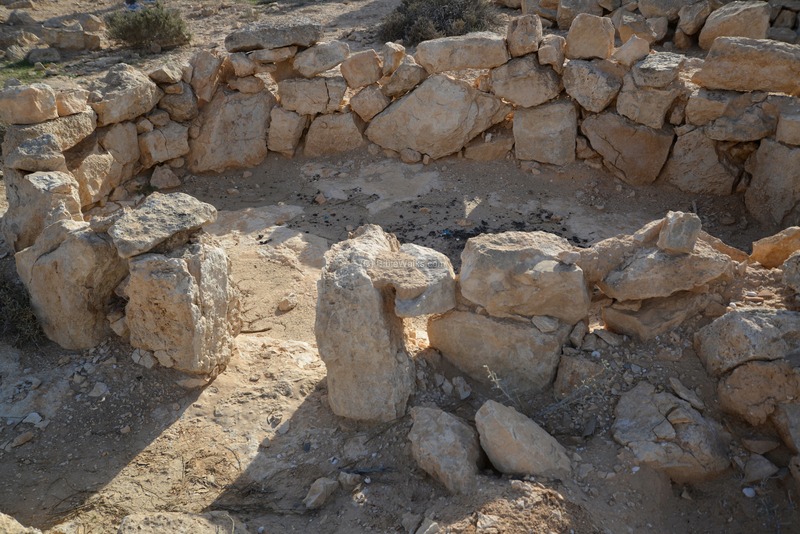 - the burial methods have changed: most of the tombs were erected inside the villages rather than outside, under the floor of their dwelling places. The ancient village covers about 12 dunams (3 acres), spread on two hills. 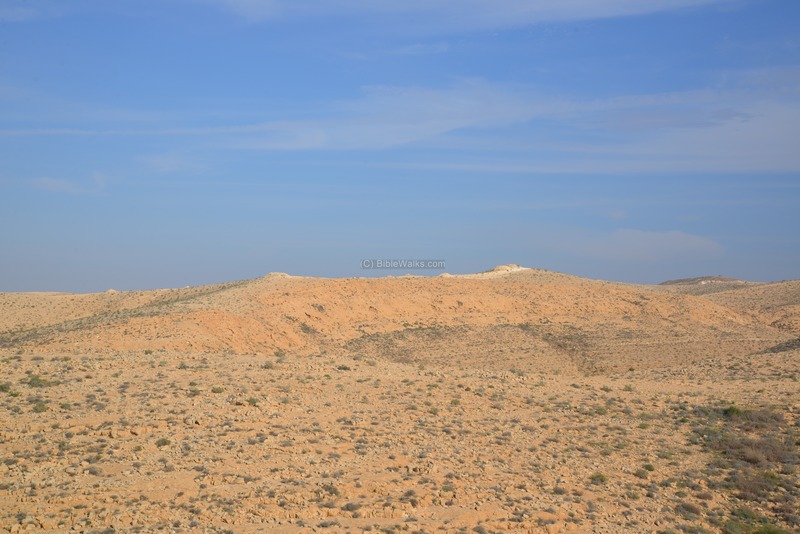 The highest point on the southern hill is on an altitude of 425m, while the lowest structure is at 417m close to the saddle point between the two hills. The lowest point on the north hill is on 409m, with the peak at 419m. 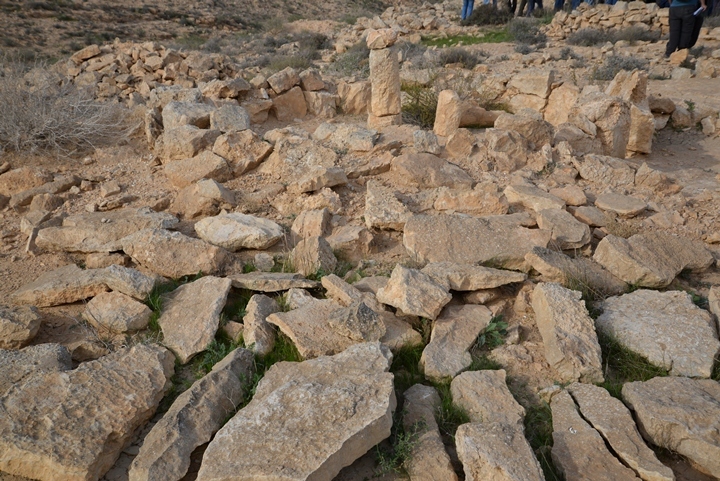 About 100 circular structures were identified on each hill, spread around without a clear pattern. The structures are not positioned around a central courtyard, are isolated from each other, and seem to have been added in random. The growth of the site may have followed the natural growth, with every generation adding more structures around the houses of the elder family members. Therefore, this village may have been a dwelling place of a tribe or two, which grew in size over time. 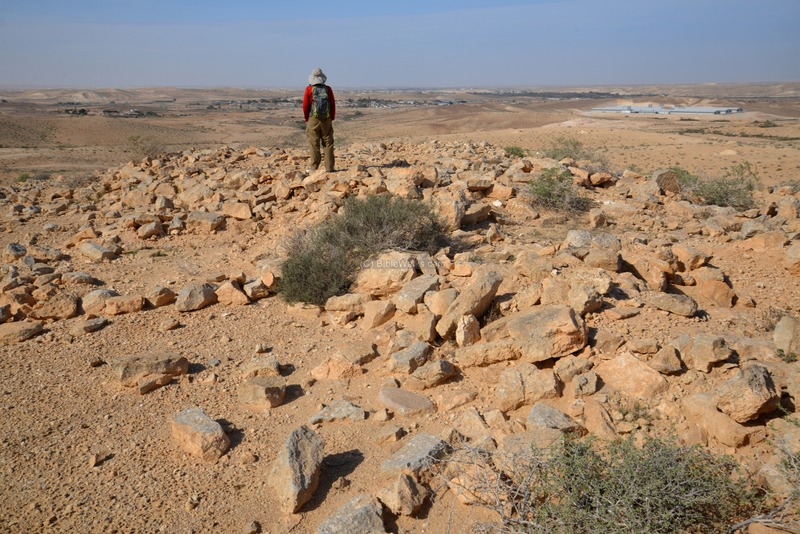 Most of the site looks like in this photo - piles of roughly hewn field stones. The IB dwellings are single circular or semicircular chambers, each hosting one member or a small family. These small single chamber structures are several meters (2-6) in diameter, with a stone roof supported by a single, two or three vertical stone columns. In the following photo is one of these structures, seen with a single central column in the middle of the circles, and the stones of the side walls and roof lying around the circle. 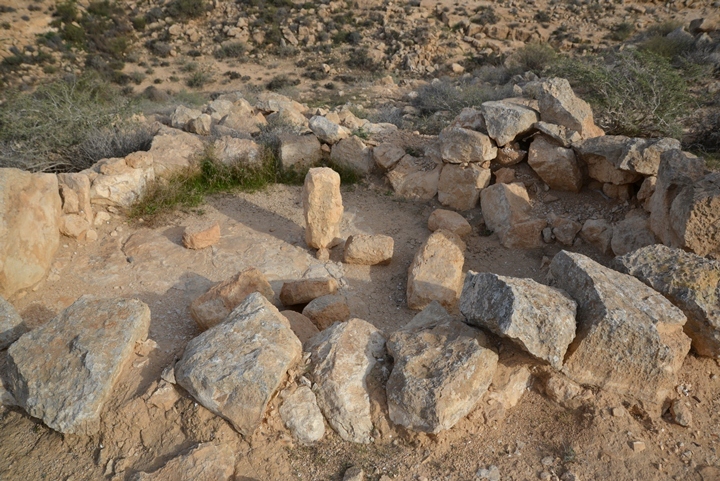 After reassembling these circular structures, and clearing the side and roof stones, a typical base of the structure is seen in the following photo. A single entrance to the structure is located on one of the sides, often on the east or north side. 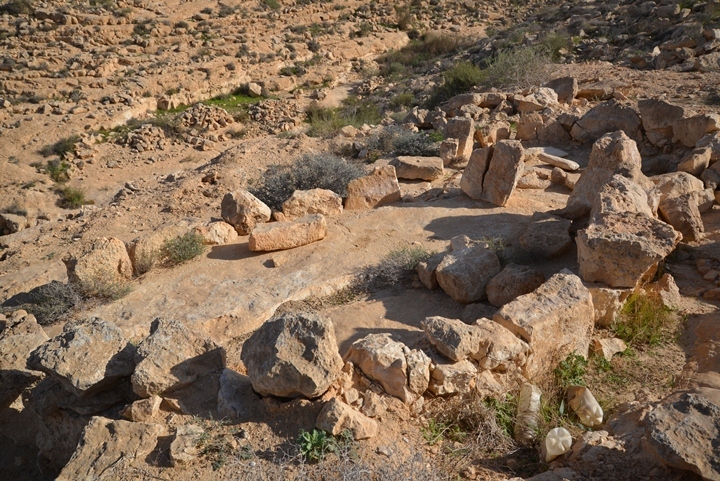 This structure is in area "B", on the western side of the south hill. Another view of the same structure is in the next photo. The base of a smaller structure is located on its eastern side. 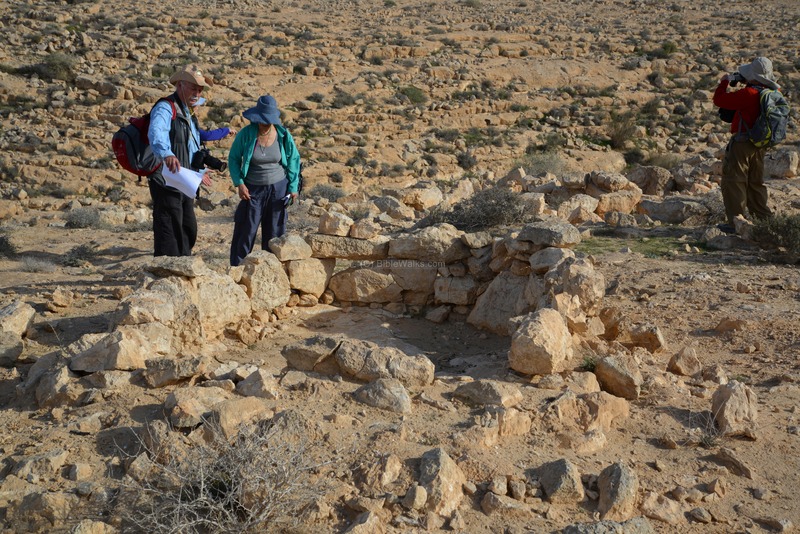 The next photo is a closer view of the central column and the floor of the house, with Dr. Ron Be'eri explaining the plan of the circular dwelling house. The central column was based on a single or several long vertical stones that supported several wooden beams. 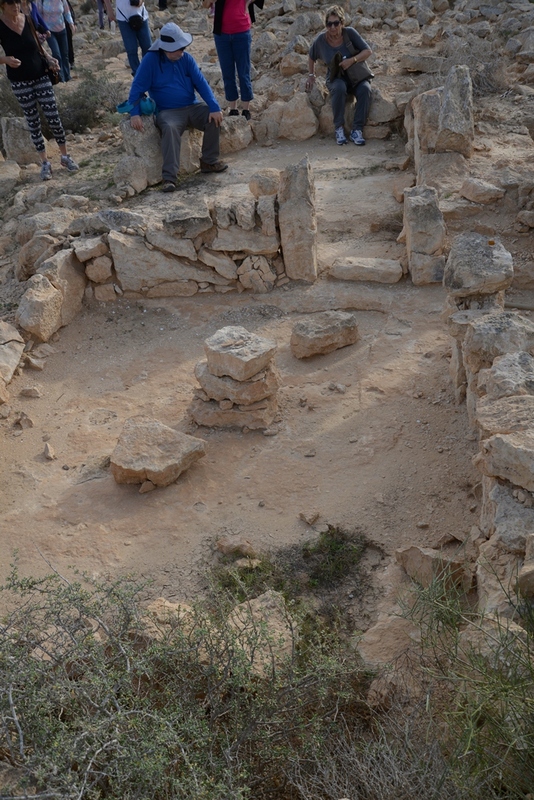 The wooden beams, prepared from Acacia (Shitta) and Tamarisk (Eshel) trees that grew in Nahal Revivim, were laid in a radial fashion from the center column to the side walls. Flat stone slabs were placed above the beams, with mud sealing the cracks, thus sealing the structure from all sides but the entrance. The dwelling structure thus became isolated. The advantage of stone walls and roof is that they keep the house cold and shaded during the heat of the day, while warm during the cold desert nights. On the south hill, 11 structures were excavated and reconstructed. Two excavation sites were held in the south hill (areas "A" and "B"), while on the north hill 3 excavation areas were examined (areas "D"-"E"-"F"). Another view of this structure is in the next photo. Notice the cup-mark on the floor. The edge of the south hill was not yet excavated. Dozens of more structures were mapped here. Behind a low saddle is the north hill, with more structures. The northern hill also has about 100 ancient structures. Three excavation areas were opened here ("D-E-F"). 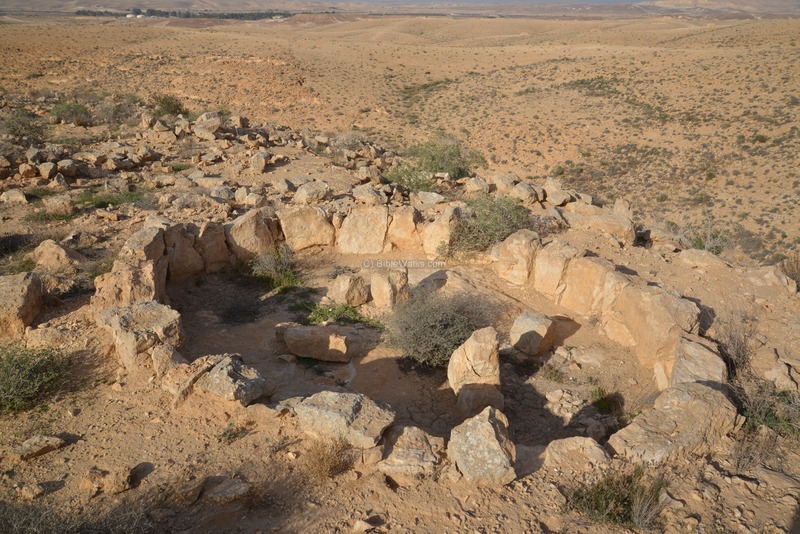 The archaeologists unearthed 5 more circular structures and one unique rectangular structure. 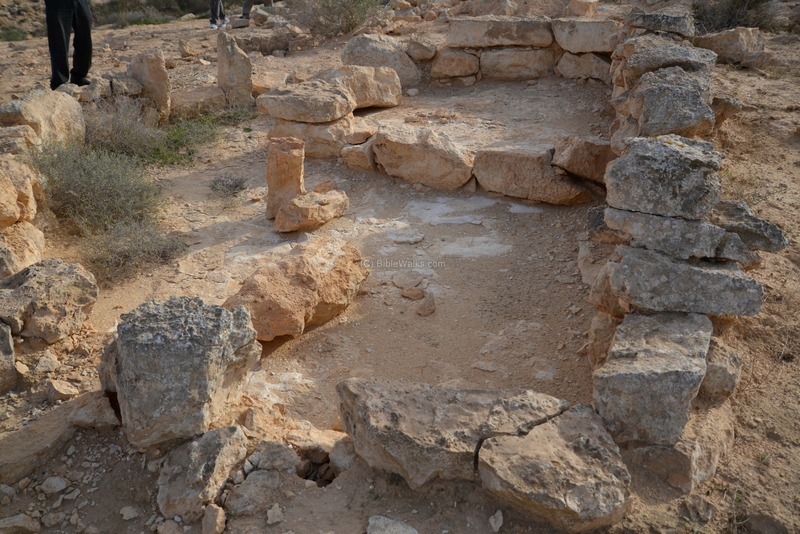 The most unique structure that was excavated so far has a rectangular plan. It consists of three chambers, two adjoining chambers with double columns (below, on the left and right sides) and one with a single column (behind the two chambers) . Its plan is known as the "Aradian" design - a broad house plan of the Early Bronze period, based on a rectangular room which was entered from the courtyard along its long side. 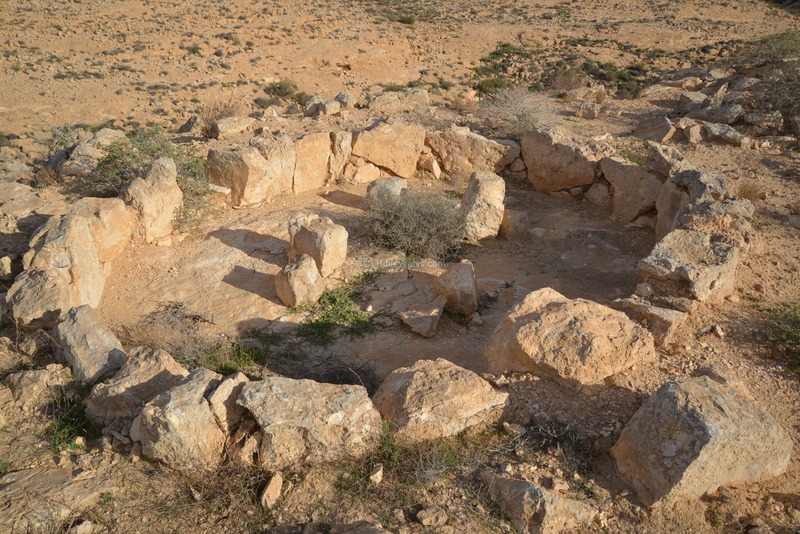 Another view from the north side of the rectangular structure, focusing on the eastern chamber, is seen below. Caution: please do not sit on the walls, as this might damage the ancient walls. 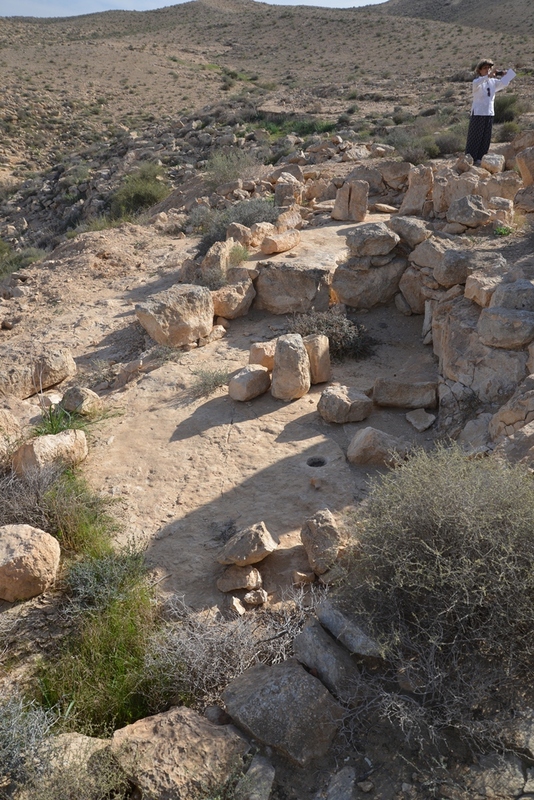 The broad house structure is located on the top of the northern hill, and may have been the dwelling of the chief or the elder member of the family. A number of ceramic vessels and copper instruments were found in the structure. 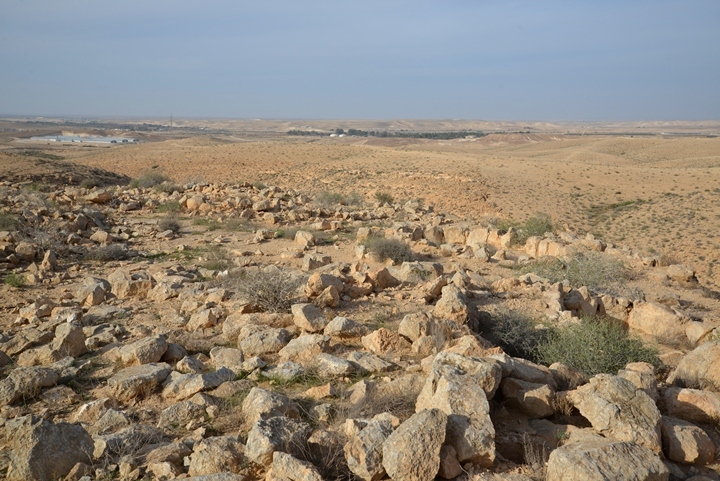 The north-most section of the hill was not yet excavated. More structures are located along the foothills. In the far right background is Kibbutz Mashabei Sadeh, located a far distance (3kM) to the north. 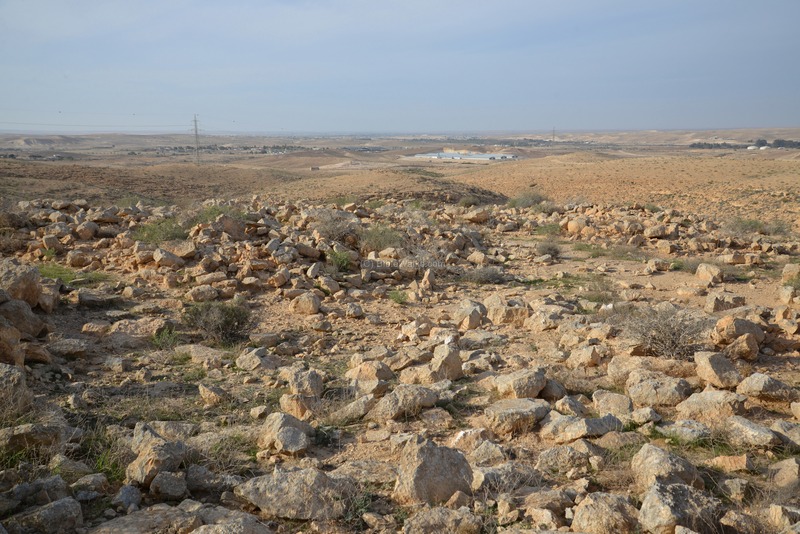 The Kibbutz is located on the banks of Nahal Revivim, which was probably where the locals fetched their waters. This raises the question of the choice of location, as most ancient settlements were located close to the water sources, on the side of main roads and protected by natural defenses. These features do not seem to fully fit the characteristics of this village, as the distance to the optimal location is too far. This is one of the open questions that the archaeologists need still to come up with explanations. An interesting site is located to the east of the village. This large structure, seen here on the right side of the ridge, has bases of walls with the form of two concentric circles. Inside the circle are traces of walls and many cup marks surround the structure. 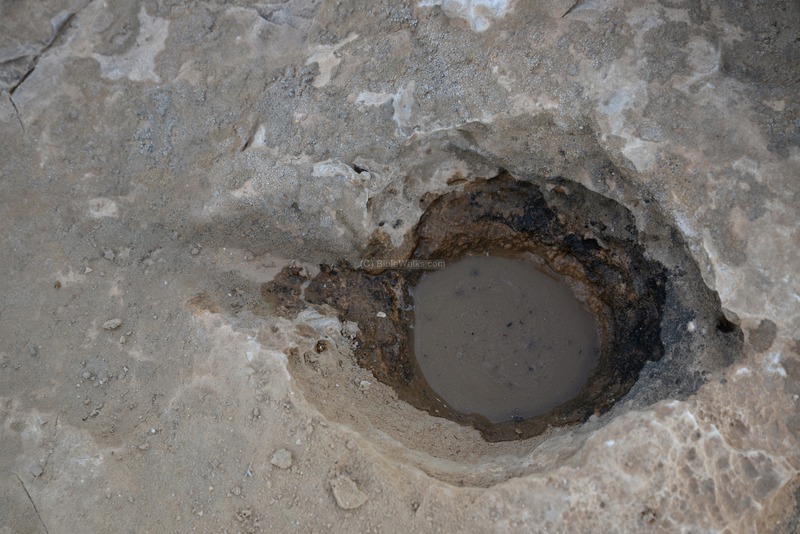 This may have been the ritual center of the tribesmen, as cup marks and circular assembly areas often indicate a ritual place near burial or religious sites. Additional tumuli can be seen on the ridges at the left. We are anxious to return here to explore more of this wonderful site, and take some drone pictures from above. The area around the site was a source for flint stones. Flint is a hard sedimentary rock that breaks with curved breakages (conchoidal fractures), causing it to split into sharp edge pieces. 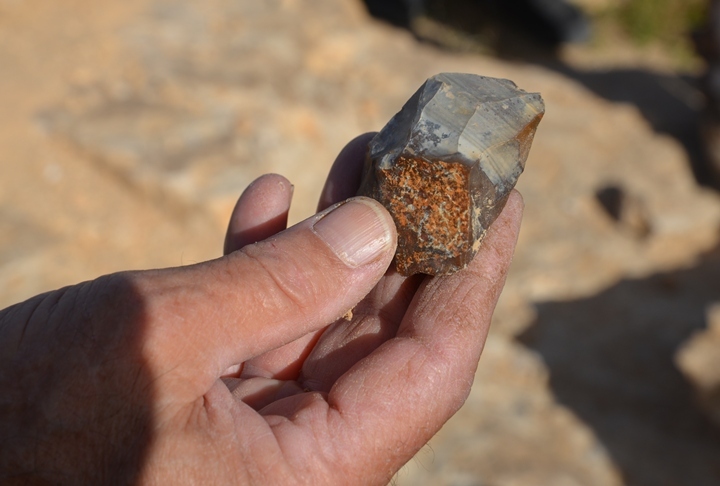 Flint was the preferred material for making tools during the early times, such as knife blades, arrow heads, axes, scrappers, spear points and more useful tools. 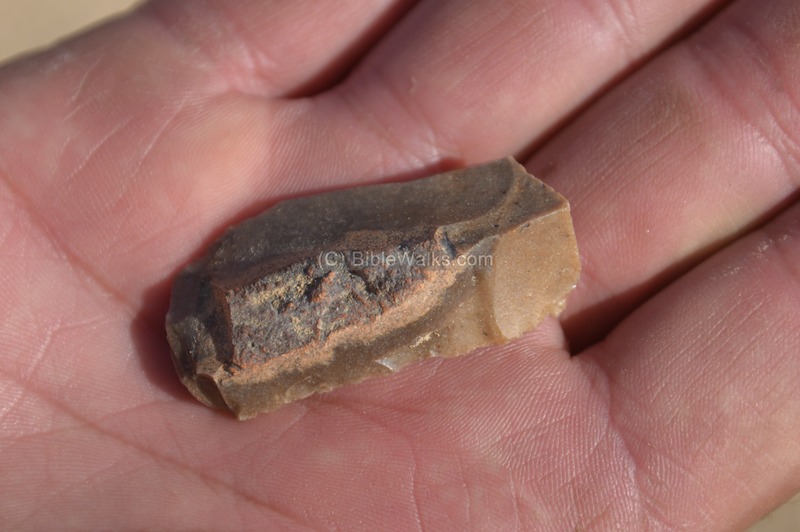 The flint tool making may have been one of the sources of income for the villagers. The use of flint earned the term "stone age", when flint stones were used to make these sharp edge implements. 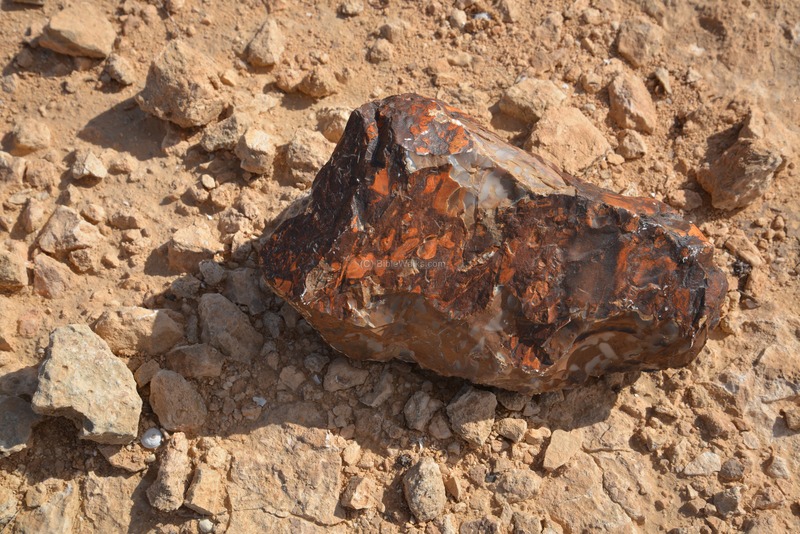 This period lasted 3.4 million years, ending during the Bronze age when the metalworking gradually replaced stone-working. A quarry of Flintstones is located to the east of the south hill, just across the valley. It is seen in the photo below as a reddish color, in the middle of the foothill. Metalworking: The excavators found fragments of a Bronze age copper ingot in this village (Cohen 1999). These crescent-shaped bar ingots were found in Early and Middle Bronze period sites in the Negev Highlands and in the north. These narrow and long bars, made of very pure copper, were used for the production of Bronze, after being alloyed with tin. The copper ingots were also used for the final product. Many similar ingots were found elsewhere in the Negev, while Bronze items were rare during this period. 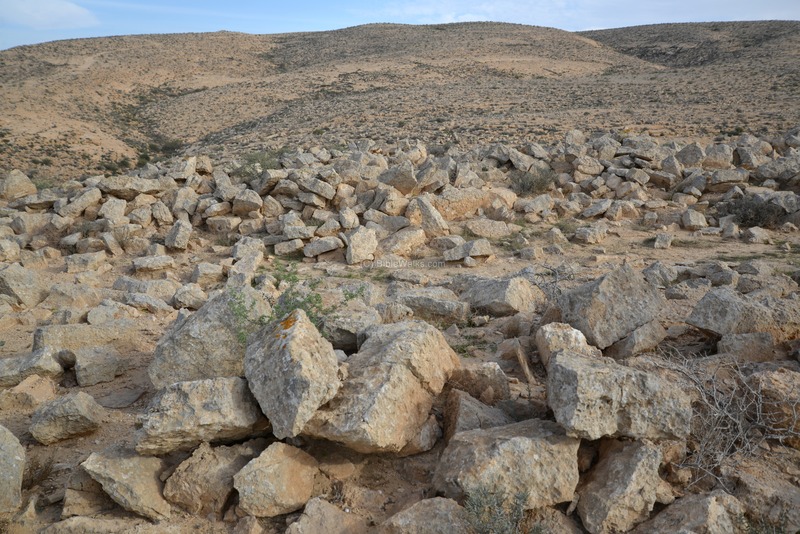 Installations: The Early Man also cut into the local rocks to create agriculture installations. In the photo are cup marks - small holes carved into the local stone. 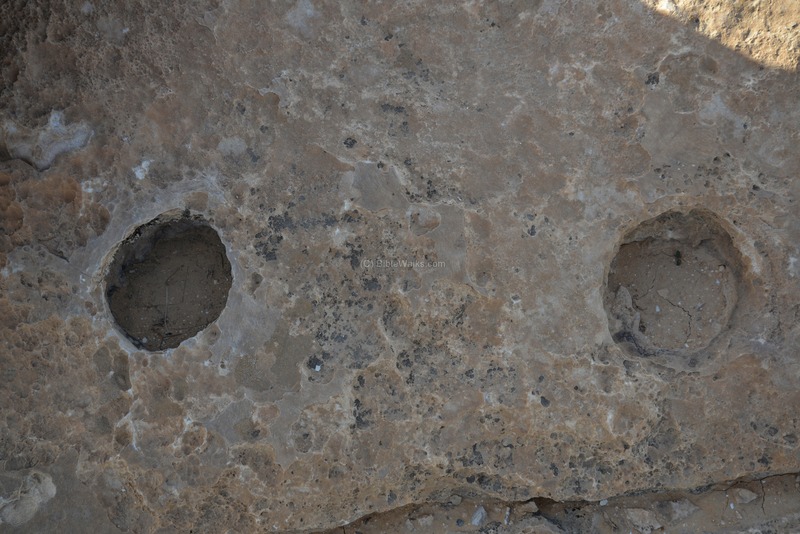 They may have been used to grind grain, using a flint stone to crush the grain inside the groove. Another installation has a groove that leads into the hole. This may have been a small olive oil production installation, where the groove channeled the crushed olive juice into the hole. Mashabei Sadeh (also Mashabei Sade) - Hebrew: Field resources. The Kibbutz was established in 1947 as "Mashabim", then renamed commemorating the Palmach leader Itshak Sadeh. Tumulus (plural: Tumuli) - mound of earth and stones raised over a grave. In Hebrew: Rogem. Ant. 340/640 Early Bronze Age IV - 109 pages, Power Point, Gregory Mumford (2014) - great resource!